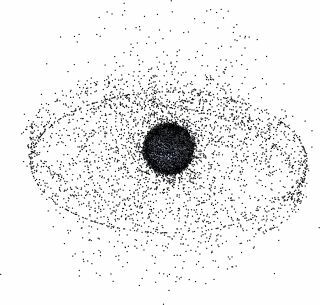 Space junk shrouds Earth — creating obstacles for future spacecraft. Future spacecraft could think for themselves using the same technology that powers Bitcoin. A new $330,000 NASA grant supports work to develop autonomous spacecraft that could make more decisions without human intervention. One example could be enabling spacecraft to dodge space debris at a distant planet or moon faster than a human on Earth could help out the far-away probe, according to a statement on the research. "I hope to develop technology that can recognize environmental threats and avoid them, as well as complete a number of tasks automatically," principal investigator Jin Wei Kocsis, an assistant professor of electrical and computer engineering at The University of Akron in Ohio, said in the statement. "I am honored that NASA recognized my work, and I am excited to continue challenging technology's ability to think and do on its own," she added. If proven, Wei Kocsis' early-stage research would be especially useful in deep-space environments, where spacecraft communicating back to Earth must currently wait for hours for a response. Instead, her work would enable the spacecraft to perform tasks using blockchain technology. In the digital-currency world, blockchain is used to record transactions securely, without the need of a central management database such as a bank. There are many variants of digital currencies, but the most popular is known as Bitcoin. The new work uses technology incorporated into a different digital currency, called Ethereum, that not only records transactions but also can execute decentralized code, such as automatically running a transaction when conditions are met. Wei Kocsis' NASA Early Career Faculty grant would use Ethereum blockchain technology for these self-executing contracts, also called "smart contracts," to enhance digital decision-making in spacecraft. "In this project, the Ethereum blockchain technology will be exploited to develop a decentralized, secure, and cognitive networking and computing infrastructure for deep space exploration," she said. The University of Akron did not say how many years it would be before Wei Kocsis' technology would fly. But this project does mark the first time that NASA has explored blockchain applications for space communications and navigation, said Thomas Kacpura, advanced communications program manager at NASA's Glenn Research Center. In an interview with ETHNews, he noted that if blockchain technology works in this context, it "would support decentralized processing among NASA space network nodes in a secure fashion," and added that the network could be scaled for future growth.